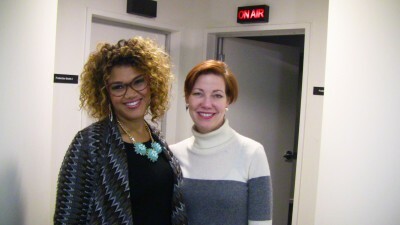 We recently welcomed Canadian soprano Measha Brueggergosman into our studio for an interview on her upcoming series ‘Songs of Freedom’ premiering on VisionTV February 2, 2015. To coincide with this powerful ‘Black History Month’ series Measha has launched an interactive website you need to experience to believe! Visit songsoffreedom.ca for photos, video and music from the show. “I loved the interview with Measha Bruggergosman and Kerry Stratton. I am a fan of MB and KS and a huge fan since 2008 of L. Hill’s book The Book of Negroes. It was fascinating to hear Measha say that she is a descendent of one of those who experienced the horrors of kidnapping and slavery. My heart is touched every time I hear these stories of tragedy, yet SURVIVAL! I also loved the interview some weeks ago with Jan Lisiecki whom I absolutely adore. And although I know this message is already far too wordy for Maestro K Stratton (!!) let me add that I listen most of the day, every day, (103.1 in the house, 96.3 in the car) and The Oasis is my favourite weekday show. I love the salon music and all the quirky and interesting programming.